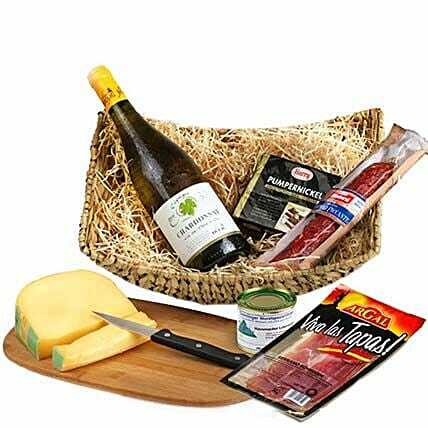 A beautiful present hamper with 1 bottle of french white wine 0,75l, 1 package of Gouda 432g, 1 package of Pumpernickel, 1 italian salami Salami Napoli 180g, 1 package of Serrano Schinken 70g and Meier liver wurst 200g Dose. The delivery takes place in a break-proof box. The delivery takes place in a break-proof box. The wooden cutting board with knife is only decoration and not included.